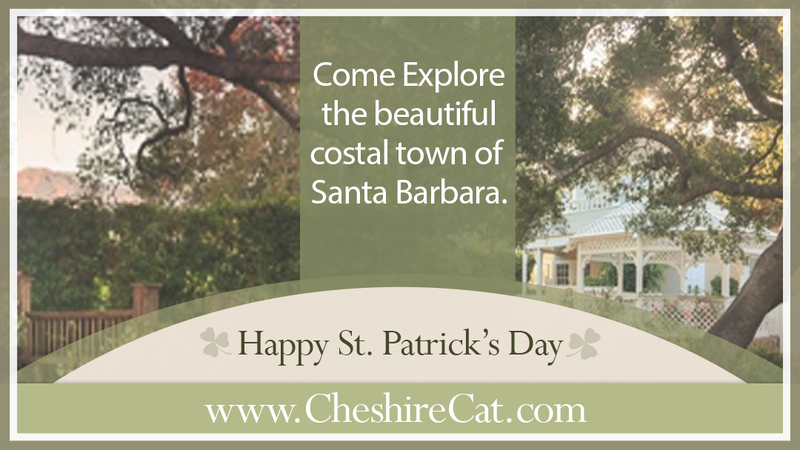 If you’re a guest staying at Cheshire Cat Inn on St. Patrick’s Day, we’ve put together a handy list of things to do in Santa Barbara. St. Patrick’s Day is a fun time to stroll around Santa Barbara and reminds us that a lush, green spring is just around the corner. The weather has been fabulous lately; feels like summer arrived early! Below is a list of Santa Barbara activities you may wish to consider while staying at the inn this St. Patrick’s Day. Urban Wine Trail: Taste some of the finest wines produced in Santa Barbara County, all within blocks of downtown and the beach. Created by a group of like-minded wineries, the Santa Barbara Urban Wine Trail offers both novices and aficionados the opportunity to learn about and taste wines of many different varieties and styles crafted from Santa Barbara County’s best vineyards. Waterhouse Gallery houses paintings from nationally known artists from the Western states and are members of the California Art Club and Oil Painters of America. The Museum of Contemporary Art Santa Barbara is where adults can learn from Santa Barbara artists during their ever popular living room conversations, panel discussions, and lecture series. Fuzion describes itself as a “hybrid retail store” that focuses on glass art pipes, men’s underground fashion, and street art culture. The store’s glass collection is a particular source of pride as they focus mainly on American made pieces. Sullivan Goss represents the works of American artists from the 19th century to today. They have spent the last 25 years curating a collection of over 3000 works featuring the best in paintings, sculptures, watercolors, drawings, prints from artists labeled as luminists, impressionists, expressionists, and modernists. Santa Barbara Museum of Natural History has twelve exhibition halls that feature a life-size 72-foot Blue Whale Skeleton, birds, insects, mammals, marine life, paleontology, and the Chumash Indians. Guests experience the wonder of space exploration in the Gladwin Planetarium. The Museum also owns and operates the Ty Warner Sea Center located on historic Stearns Wharf. Santa Barbara Zoo is always a great option, with plenty of fun family activities. With 30 acres and 500 animals, visitors need a map to be sure they seeCondor Country, the pair of realistic high-tech dinosaurs in the “Dino Doc” show, the two baby giraffes, and many more animals in naturalistic habitats. Santa Barbara Land and Sea Tours is Santa Barbara’s original amphibious tour vehicle. Guests climb aboard the LAND SHARK for a personally narrated 90-minute land and sea tour adventure and enjoy exquisite views of the Santa Barbara coastline, the American Riviera, and the Santa Ynez Mountains as seen only from a boat at sea. Susan Quinlan Doll & Teddy Bear Museum & Library is dedicated to the love of dolls, teddy bears, books and the support of doll and teddy bear artists. Chase Palm Park Antique Carousel in Santa Barbara was made in North Tonawanda, New York, by the Allan Herschell Company in 1917. Herschell was the largest manufacturer of these flights of fancy during the Golden Age of carousels. Old-fashioned calliope music plays as the carousel turns. Don’t forget to mark your calendars for the upcoming Santa Barbara Vintners Spring Weekend – April 10 – 13. This is a long weekend filled with special events held at wineries, vineyards, tasting rooms, and restaurants throughout Santa Barbara County. The Festival Grand Tasting held on Saturday, April 12 has wine tasting from all 100+ member wineries, an Art Walk, Farmers Market Pavilion, and the Connoisseur Club Pavilion. The Cheshire Cat Bed and Breakfast Inn offers tempting breakfasts and cozy accommodations in The Main House, The Eberle House, The Coach House or Bramhall, Mobberly, Prestbury and Woodford Cottages, each with its own unique charms and revitalizing atmosphere. We have relied on our 30 years of hospitality to create a relaxed and inviting atmosphere so you can simply relax and revel in the small town warmth and charm of Old Santa Barbara. If you’re looking for a little more fun, Cheshire Cat Inn is also located close to Santa Barbara wine country, downtown and within minutes of fine dining, shopping, and beaches, with plenty of Santa Barbara activities close at hand. We look forward to welcoming you on your next visit. Best of all we’ve got some greatCheshire Cat Inn Specials that include options for in-room luxurious massages or fine dining at some of Santa Barbara’s tastiest restaurants. About The Cheshire Cat Inn – Located at 36 W. Valerio Street in Santa Barbara, theCheshire Cat Inn is known for its perfect combination of location, ambience and comfort. Winner of a 2013 TripAdvisor Certificate of Excellence, the Inn’s spa treatments, quaint Victorian charms, and special hotel deals make it perfect as Santa Barbara’s Great Escape. Visit the website and Facebook page or call 805- 569-1610 for more information. 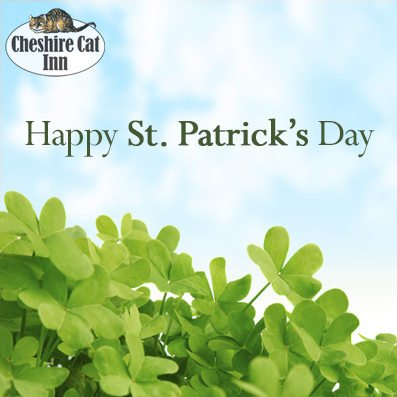 This entry was tagged bed & breakfast, bed n breakfast Santa Barbara, Santa Barbara Hotel Specials, St. Patrick's Day. Bookmark the permalink.